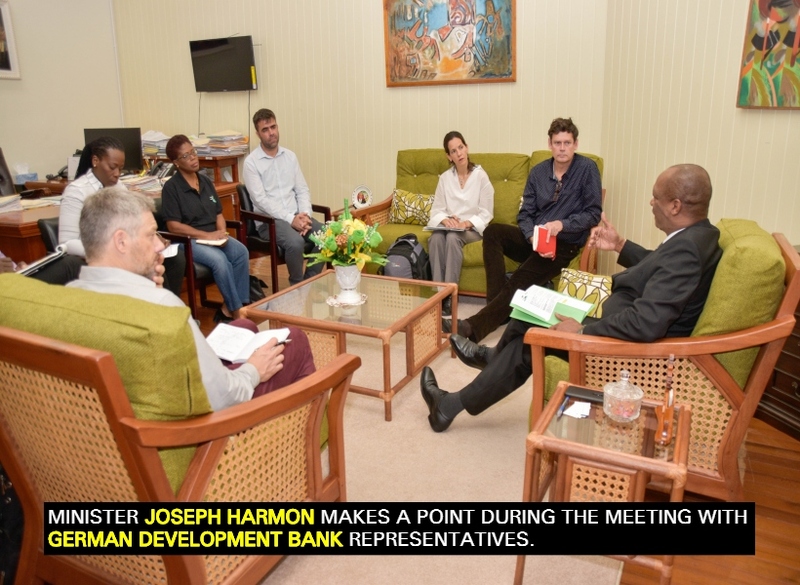 Minister of State, Mr. Joseph Harmon, this morning, met with a visiting team from the German Development Bank (GDB), which is funding a €4.8M project, titled ‘Guyana Protected Area System’ for the Protected Areas Commission (PAC). The team, which was led by Dr. Jens Mackensen, Head of Division, Agriculture and Natural Resources, Latin America and the Caribbean, included Mr. Samuel Ebert, Chief Technical Advisor, Guyana Protected Area System; Mr. Tilman Jaeger, Consultant, and Ms. Ingrid Hahn, Project Manager, Agriculture and Natural Resources Management, Latin America and the Caribbean. Commissioner of the PAC, Ms. Denise Fraser explained that the team will be travelling to the Protected Areas today to have a first-hand look at what is taking place. She noted that the Project will cater primarily to infrastructural needs and will see new ranger stations, office space and even the construction of a guest house. “There will be a focus on the infrastructure needed for the management of three Protected areas; Shell Beach, the Kaieteur National Park and the Kanuku Mountains. That infrastructure will include ranger stations, administration building and offices and there will be some equipment for the management of the Protected Areas. In addition to ranger stations at Kaieteur, there will be a guest house which will make it more economical to fly there. The project also has two other components. One is resource management, which is linked to livelihoods and this is for the communities that surround the Protected Areas and the other component is for capacity building,” she said. Minister Harmon expressed the Government’s gratitude to the entity, noting noted that the Project will significantly aid Guyana’s vision for a ‘green’ state. He said that it further cements the commitment of the Government to the preservation of the environment for this generation and generations to come. “You have the gratitude of the Government of Guyana for what you’ve been doing for us and the work you’ve done here in the Protected Areas. We are committed to this and I believe that this commitment on the part of the government has been demonstrated over and over again, especially with the promise from President David Granger to put a further two million hectares into Protected Areas. We have embarked on an unmistakable path of conservation. That is the thrust of our development going forward,” the Minister of State said. Head of the Department of Environment, Ms. Ndibi Schwiers echoed the sentiments shared by Minister Harmon, noting that the Project forms a major part of the ‘green’ vision and is critical to the achievement of a ‘green’ state. Meanwhile, Dr. Mackensen said his team is pleased with the commitment demonstrated by the Government of Guyana towards the protection of the environment as this is the most important part of the Project. He noted that with the commitment demonstrated, there is no doubt that the project will be successful.